Tonight I asked at the front desk for a recommendation for dinner and I was given Ristorante Merlo. I know, you want to add a t to the end of it! This restaurant is in a house set on the street amongst larger buildings, slightly hidden in its own way, one of those places that unless you know you’re looking for it, you miss it. 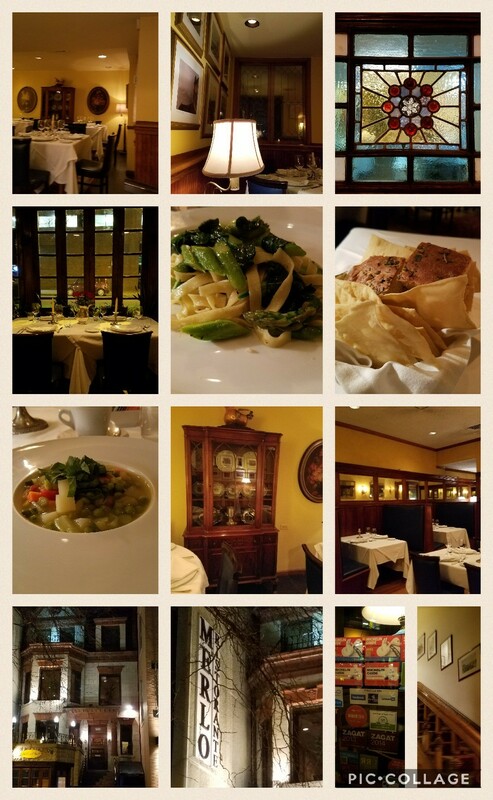 I walked in, no reservation and was taken downstairs past a bar and dining room with banquet seating, less intimate. Downstairs it looked like a place for a nice romantic dinner, family gathering, more intimate, like you might be with family. They sat me at a corner table and for about twenty minutes, I was alone in the place, a little weird, but I had my server’s attention and he was prepared to make my experience special. It is not a vegan restaurant, but they accomdated me. I had the minestrone and it was fabulous, the broth was wonderful and the vegetables were barely cooked, nice and crisp. Then the pasta came out, tagliatel, spinach, asparagus, garlic and olive oil, really nice and flavorful; I didn’t even have to add salt, lovely. It was on the al dente side, because it was fresh that day, love it! What I liked was the portion size, appropriate, not too much. The bread basket had fresh, crisp, flavorful foccaccia and crisps that were actually flash fried fresh pasta, that didn’t taste like pasta, it was great! I had really nice dinner, can’t wait to see what tomorrow holds!